Today an amazing thing happened. It became possible to print a Sierpinski tetrahedron without internal supports on a desktop filament-based 3D printer. Not a fancy laser sintering powder printer that costs tens of thousands of dollars and uses expensive printing material to boot, but a simple Etch-a-Sketch-plus-glue-gun printer that can make an object as big as your hand for less than a cup of coffee. Two key things made this possible; two things that just WORK, no muss, no fuss. Sparks of genius. The first key thing is an idea and model, both by owens on Thingiverse. He constructed a Customizable Sierpinski Tetrix model that can be printed with no supports other than a custom stand that prints underneath the model and is snapped off later. The spark of genius here is that owens' stand enables you to print the Sierpinski tetrahedron upside-down, and therefore in a configuration with no overhangs! Owens had done the same thing earlier for the Menger cube, which made us so happy that we printed and posted Menger cube models using owens' stand method for six days last month (Day 157, Day 161, Day 162, Day 169, Day 170, Day 171). I'll say what I said about this on the first day: sure, it's obvious now, but nobody else put the pieces together before owens did, and in addition his execution is great. The model easily breaks off the supporting stand it prints with; no muss, no fuss. The second key thing is a machine: the MakerBot Replicator 2. I now have access to three of these machines, one in the JMU MakerLab in the Department of Mathematics and Statistics, one in the JMU 3-SPACE general education 3D-printing classroom, and one in my house, right here on my desk. This machine just works. Out of the box. With minimal fiddling with print settings and calibration. And it produces absolutely stunning prints, even at the .3mm/low resolution that we used today for the Sierpinski triangle. In my job running MakerLab and 3-SPACE I help maintain sixteen 3D printers of various makes and models. Some are ABS, some are PLA; some are multiple-extrusion and some are not; some work better than others and some need more attention than others. Each one fills a role in our lab and in our classroom, and each one breaks, has printing catastrophes, and has to be taken apart and put back together from time to time. We had some bumpy times early on as I was learning and the Replicator needed some replacement parts, but now that we've settled in, the Replicator 2 is the boss at printing mathematical objects. 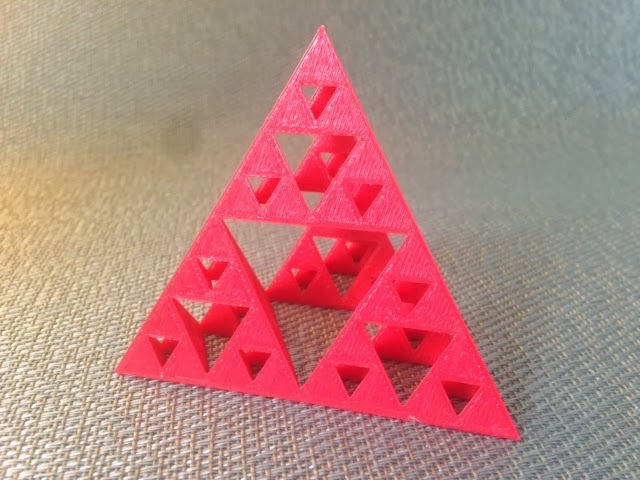 Your filament 3D printer doesn't have to be a Replicator 2 to print owens' Sierpinski triangle, but it sure as heck doesn't hurt. Settings: MakerWare .3mm/low on a Replicator 2 with no raft and no supports. Prints with a stand that easily snaps off after printing.